4H Bingo Bingo Cards to Download, Print and Customize! Print 2 pages of 4H Bingo Bingo Cards for free. Download a PDF with 2 free pages of bingo cards plus instructions and a randomized call sheet. 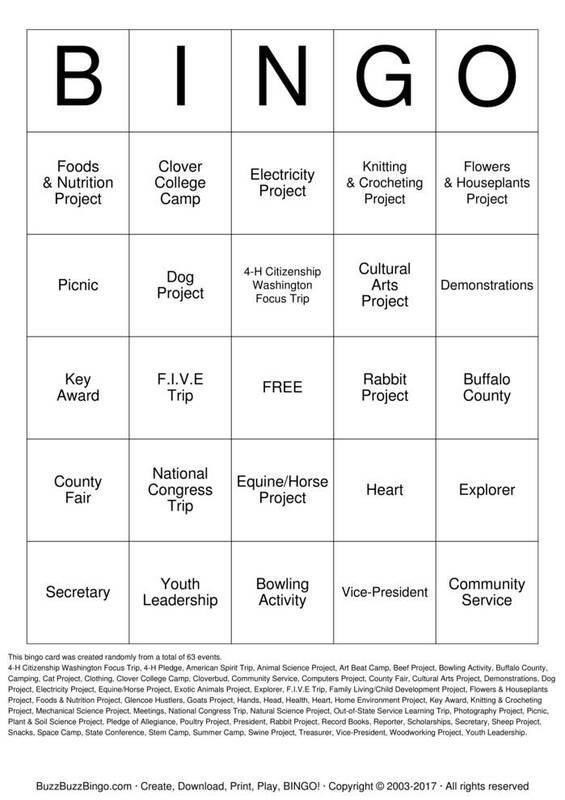 Play 4H Bingo bingo in a browser or customize the events, free space, etc. Purchase more randomly generated bingo card pages below. 4-H Citizenship Washington Focus Trip, 4-H Pledge, American Spirit Trip, Animal Science Project, Art Beat Camp, Beef Project, Bowling Activity, Buffalo County, Camping, Cat Project, Clothing, Clover College Camp, Cloverbud, Community Service, Computers Project, County Fair, Cultural Arts Project, Demonstrations, Dog Project, Electricity Project, Equine/Horse Project, Exotic Animals Project, Explorer, F.I.V.E Trip, Family Living/Child Development Project, Flowers & Houseplants Project, Foods & Nutrition Project, Glencoe Hustlers, Goats Project, Hands, Head, Health, Heart, Home Environment Project, Key Award, Knitting & Crocheting Project, Mechanical Science Project, Meetings, National Congress Trip, Natural Science Project, Out-of-State Service Learning Trip, Photography Project, Picnic, Plant & Soil Science Project, Pledge of Allegiance, Poultry Project, President, Rabbit Project, Record Books, Reporter, Scholarships, Secretary, Sheep Project, Snacks, Space Camp, State Conference, Stem Camp, Summer Camp, Swine Project, Treasurer, Vice-President, Woodworking Project, Youth Leadership.